Let’s hope till June | The Cesspit. At the moment the only MMO I’m playing and willingly to play is Football Manager (that is mostly awesome). On the horizon there is absolutely NOTHING that interests me. I could go back to WoW for a while once they decide that dual speccing is a good thing, but that’s it. The rest is crap and in the future there’s nothing that looks promising. But then there’s “Jumpgate Evolution”. Jumpgate was one of the first MMO I played. Really. At the time I only played Ultima and I think only a few months later after Jumpgate I started DAoC. The first Jumpgate was a promising game with lot of potential. The problem is that once released in beta form (it worked, but extremely barebone) Netdevil simply STOPPED to develop it. There were no patches to the game with the exclusion of very minor fixes. No devs presence. They just released the thing and forgot it existed. A behavior that became typical of Netdevil. They don’t care about what they do, and it shows. At the end I mostly ran fed-ex missions and got bored really fast. 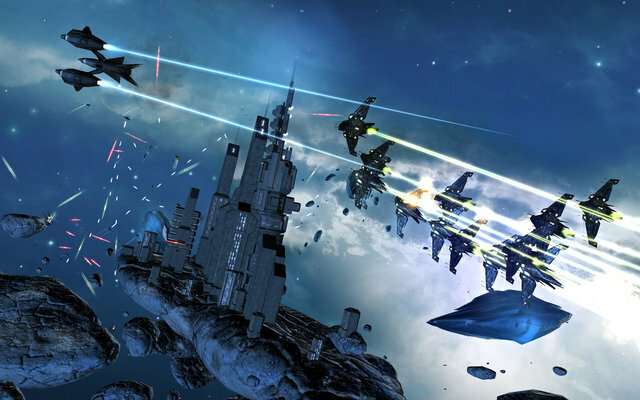 Combat was a mess and this isn’t a game like Eve-Online where you concentrate on the tactical aspects. Here flying was extremely hard due to the flight model used (the one where the heading of your ship doesn’t affect its direction). Jumpgate Evolution LOOKS like the perfect game I ever wanted (and with me a whole lot of players). They changed the flight model with one closer to other sims. It’s a dogfighting game, so with gameplay supposed to be where the fun is. The features list is everything I wanted (minus the randomly generated missions). An exhilarating PvP open world, fighting for territories, conquest, huge battles, dogfights! Or at least I hoped. Then you read on forums that the game is built like WoW. It has levels segregating players, world divided into zones and instances, the twitch combat is severely limited and PvP happens on battlegrounds. Oh well. From an immense racing world to an entire universe, Codemasters Online and developer NetDevil announced that Jumpgate Evolution®, the action-based PC Massively Multiplayer Online game that promises exhilarating space combat on a vast scale, is scheduled for take-off this June. The graphic looks extremely good for this type of game. But here it’s all about gameplay. The world is still waiting for a massive X-Wing/Wing Commander type of game. We don’t need anything new. We don’t need to even RESEMBLE to WoW. It’s already all done, only needs to be made. Hopes up till June. Then the usual huge disappointment. This is going to be another “Earth and Beyond”. But then you can invite me to beta and spare me the later disappointment.